The brushwork in Genesee Scenery is typical of an oil sketch int he almost gestural application of paint. The immediacy of the brushstrokes energizes the entire composition. The painting measures only 5½ x 4 inches, yet it easily stands on its own as a "finished" piece, and shows Cole at his informal best. The falls of Day-gay-ya-soh Creek, pictured here, are less dramatic, but still visible today. Long gone are the wooden bridge, the two tiny figures, and the red wooden building that once served as a mill. 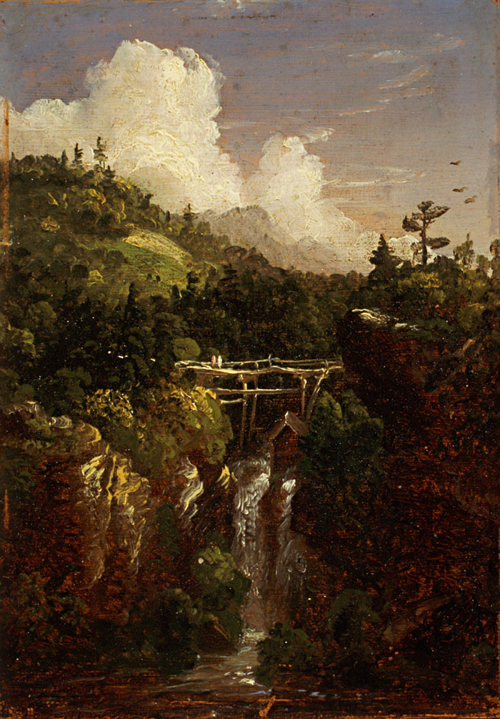 However, in his intimate sketch, Cole captured a sense of place, and the true essence of one small but stunning view of the Genesee. The suggestion of birds in flight here might be a reference to the turkey vultures that still glide over the gorge in Letchworth State Park.